Steven Barrett, John Hart, Dina Katabi, Timothy Swager, Michael Strano, Sheila Kennedy, Evelyn Wang, Justin Solomon, and Or Hen were recognized at a reception on Monday, Nov. 20 2017, hosted by MIT President L. Rafael Reif and attended by past awardees. 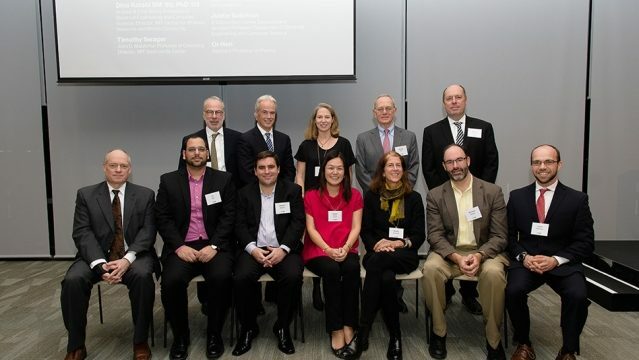 To celebrate the fifth anniversary of the Bose Grants, MIT also held a colloquium that included a panel discussion about the importance of philanthropic support for basic science research. Is it possible to develop a propulsion system for drones and airplanes that involves no moving parts? 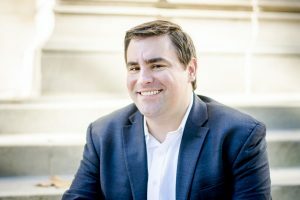 That is the question that LAE Director Steven Barrett will explore with his Bose Grant as he works on developing solid-state atmospheric propulsion technology. “If you think about the history of aviation at a sort of fundamental level, the way in which aircraft are being propelled, the source of thrust, hasn’t changed for over 100 years. It still needs a propeller or a turbine,” he explains. Barrett’s research will employ a principle that involves ionizing air and accelerating the ionized air in an electrostatic field. As the accelerated ions collide with air molecules, they transfer momentum, creating a propulsive force. For example, Barrett would like to integrate a solid-state propulsion system into the skin of an aircraft, eliminating the need for external engines or propellers. “The aircraft would pull itself through the air by ionizing air over its surface and then accelerating that air electrostatically,” Barrett explains. Barrett is excited to use his Bose Grant to see how far forward he can push solid-state propulsion technology. “I think this project fits into the spirit of Bose, which is to do things that are clearly unconventional, high risk, and where you don’t really know if it’s going to work or not, but you think it’s worth taking a risk,” he says.